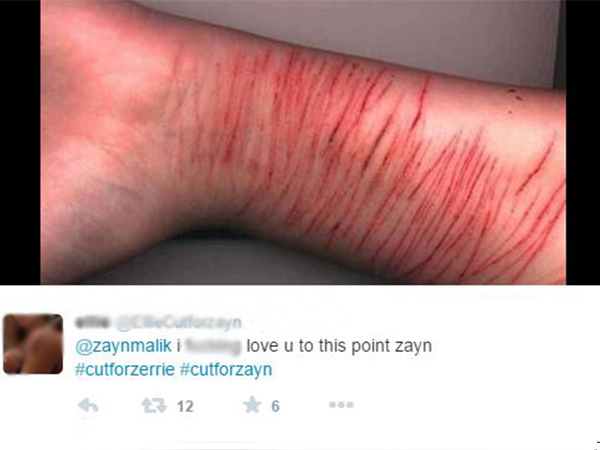 Are SA teens cutting themselves for Zayn Malik? 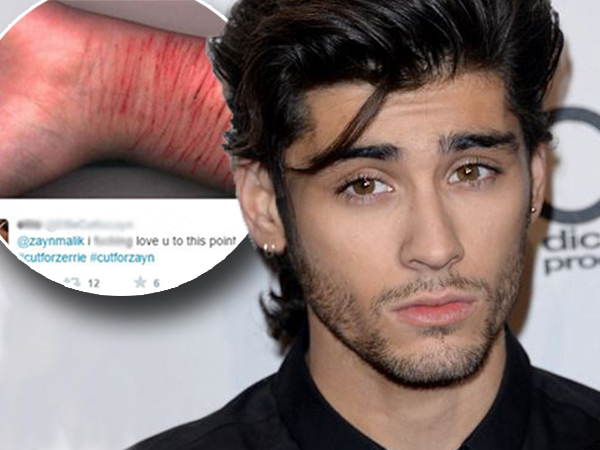 The surprise over Zayn Malik dropping out of the popular boy band One Direction just days before the group was to perform in South Africa has sparked a disturbing trend among distraught teenage fans who are cutting themselves and then posting images on Twitter. ER24 said that it is not aware of any reports of teenagers in South Africa cutting themselves, but has confirmed to Health24 that teens are self-harming themselves. "With Zayn Malik we cannot confirm if there were cases specifically in South Africa at this stage," said spokesperson Chitra Bodasing. However, cutting is indeed taking place and more shockingly by children as young as 10-years-old, she said. "While there are not many children at this age who cut themselves, we can confirm there have been such cases"
Bodasing said the most common age range for cutting is between 14 to 21. She added that ER24 is concerned that there are a number of children across the country resorting to cutting. "It has been brought to our attention that as many as 50 children in certain schools are resorting to cutting themselves due to a number of reasons. "This is a shocking number. Cutting is more common in high schools than in primary schools," she said. Bodasing also noted that the call to cut for Malik highlighted how easily and far teens will go in attempting to identify with celebrities on a more personal level. Executive member of Psychological Society of South Africa and private clinical psychologist Rafiq Lockhat explained to Health24 that teenagers teenagers get sucked into the lives of celebrities because it is seen as fascinating and amazing. "For teenagers who are grappling with normal mundane stuff like school, parents and siblings, a celebrity's life suddenly becomes fantastic. So they kind of absorb themselves into the persons life as a way out of their drab life. "Every single aspect of these celebrities' life becomes critically important to these teenagers because it is so vastly different to their 'boring' lives." He cautioned against self-harm as a form or expression, saying once it is entrenched as a form of expression, it will likely set a precedent for what teens will do the next time some celebrity does something. ER24 trauma support co-ordinator Henning Jacobs said in a statement that the call for self-harm due to Malik leaving the British boy band could have been sparked by someone who is addicted to cutting. "Someone could have started this craze out of hatred or anger, but is most likely an addicted cutter," he said. “The problem with a craze like this is that it might pressurise non-cutters to start cutting themselves just to fit in with the crowd or friendship group. Jacobs said many troubled teens find their identity and acceptance from groups like One Direction, adding that teenagers take the “break-up” so seriously and personally and feel as though the band member has left them. “This will in turn cause real emotional pain. They then resort to cutting themselves,” he said. Jacobs also shared some tips for concerned parents. He said marks will be left behind if children are cutting themselves intentionally. "If your child is always wearing long sleeves or long pants, even throughout summer, they might be cutting themselves." He warned parents not to burst out in anger if they find out that their child is cutting him or herself because it will make the situation worse. “Reach out with a helping hand and love. The first step is to determine whether your child is cutting due to group and friendship pressure or if they are addicted to cutting. “If they are simply cutting because of group pressure, then parents can help the child through support, love and guidance. However if the child is a cutter or addicted to cutting due to trauma or depression, parents must seek the help of an educational psychologist,” said Jacobs. Malik, one of the five members of One Direction, rose to fame in 2010 after taking part in the reality-television competition The X Factor. The 22-year-old caught fans unawares when he left the band in March, just days before the group was to perform in the South African leg of their On The Road Again World Tour. In an official statement by One Direction, Malik said: "I feel like it is now the right time for me to leave the band". He added that he wants to be able to relax and have some private time out of the spotlight. "I'd like to apologise to the fans if I've let anyone down, but I have to do what feels right in my heart." Members Niall Horan, Harry Styles, Liam Payne and Louis Tomlinson said they are sad to see Malik go, but respect his decision. "The past five years have been beyond amazing, we've gone through so much together, so we will always be friends."